This has been one of the craziest days in a long time. A whirlwind day! It all started at midnight when I woke up - and couldn't fall back asleep. It felt like I laid awake all night long. Then, at 5am, I heard Brian crying. That doesn't happen very often that either of the kids wake up crying. I had the brilliant idea to bring him into his big boy bed with the hopes that we could both fall asleep in there together. Bad idea. He did lay there for a while - cutely pulling the covers up under his chin and then holding my hand under the covers. But then he popped up and wanted it to be story time. After a short while I put him back in his crib and he was not happy. He was pretty much up from that point on. Unprecedented in this house. Before noon it was a madhouse here. People coming to the door - landscapers needing my attention (they were putting down mulch) - a representative from the car dealer came to pick up my car and needed me for about a half hour - phone ringing off the hook - I was racing from one thing to another to another. We put the boys down for a morning nap because we had a playdate planned for the afternoon. I was SURE that Brian would fall asleep after his early morning. I was wrong. As I sat at the island paying bills and listening to the boys playing on the monitors, the phone rang. It was Gavin's geneticist with some pretty interesting news. Gavin's last round of intensive genetic testing was back in 2007 when he was just a baby. Thanks to scientific advances, there was updated and improved testing available which he had a few weeks ago. This array showed a small deletion on his third chromosome. It may mean something - it may mean nothing. The deletion, she told me, was a "familial variant" which means that he would have inherited this from me or Ed. She told me that both of us would need to get blood tests so they could pursue this further. They also decided to pursue a syndrome that I came across. I have, for lack of a better word - a "hobby" - of googling syndromes and disorders all through the night. The one I found, however, wasn't from my regular "research". 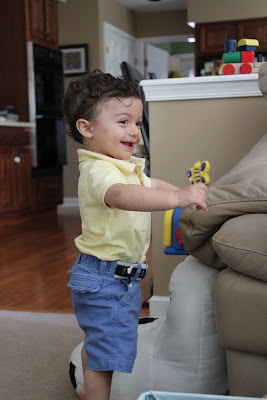 A friend asked how I found all these "possible diagnoses" on the internet and told me some physical characteristics of her son that concerned her. I said, "You just google each of the characteristics and see what pops up" - which I did. Up popped "FG Syndrome". I read it with my mouth open. It was like reading Gavin's biography. So, tomorrow he will have new blood drawn at the hospital. They will then send his DNA to Boston University to pursue the possibility of FGS. This is all very exciting to me. I know that it could lead to a dead end - but I'm also hopeful that we are close to an explanation as to why Gavin is the way he is. I have written before that it won't change anything in our eyes - but it will be nice to know "why" and "what now". 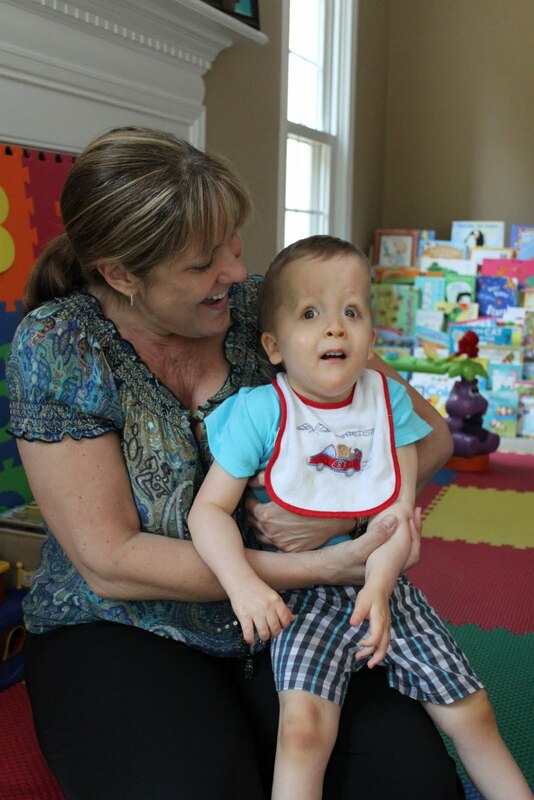 Shortly after the phone call, Gavin's hearing teacher arrived for her monthly visit to check on him. We chatted about the lack of changes in Gavin's hearing (which is a great thing!) and we even chatted about Brian's upcoming hearing evaluation (August 3rd). We always love seeing Miss Carol. She's such a big part of our lives. 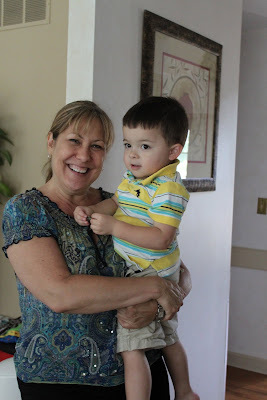 About ten minutes after Carol left, my friend Elaine arrived with her gorgeous son Cooper for a playdate! ...and was showing off like a maniac the entire playdate. When I say maniac, I mean completely bonkers. Out of his mind. Between the playdate and the lack of sleep - Katja and I were looking at each other dumbfounded. Brian was acting completely out of character. Unless this is now the "new Brian" - in which case I'm going to look into the exchange policy I came home from the hospital with. But the show must go on - so Elaine and I continued to try to talk over Brian's shrieking and show off antics. And I just kept staring at little Cooper - his dimples just stole my heart! Elaine was a teacher and has such a way with kids. At one point, they were "bug hunting" out the front window. Brian just couldn't get enough of her! We ended the playdate when it was time for the boys' snacks and I snuck in a group shot before Cooper had to go home. We had such a good time. I brought Brian up for a nap and he seemed grateful for the "downtime" - he went right into his crib and fell asleep within seconds. I think Gavin was happy for the "quiet time", too, and the two of us just laid on the playroom floor to breathe. It had been a long day. As we laid there, Gavin turned over and sweetly touched my face and I felt a lump form in my throat. So many nights over the last 3 1/2 years I have stared at the ceiling with tear stained cheeks. I've gone over every minute of my pregnancy - sure I was somehow to blame. And now...to think that we may be close to an explanation. And knowing that the explanation could mean I could stop destroying myself with guilt. And wondering if a diagnosis will help us help him in ways that we aren't already...it's all just overwhelming to me. kate! What? No link to FG syndrome? Just not like you ;) I'm off to google. Super excited for the possibilities of answers! As for Brian, maybe because you have been reading books in his big boy bed so much, he thinks it's for reading books in, not sleeping. Maybe try telling him "it's time to go to sleep" when you put him down. Then, he should make the connection when you put him in his big bed and say the same thing. That's about all I can think of off my head.